Lobia Rassedar is a delicious North Indian style gravy that goes well with rice and with chapatti. You can eat it with bread too! You can make the gravy as thick or as thin as you desire. Try it out for a Protein Rich healthy diet. 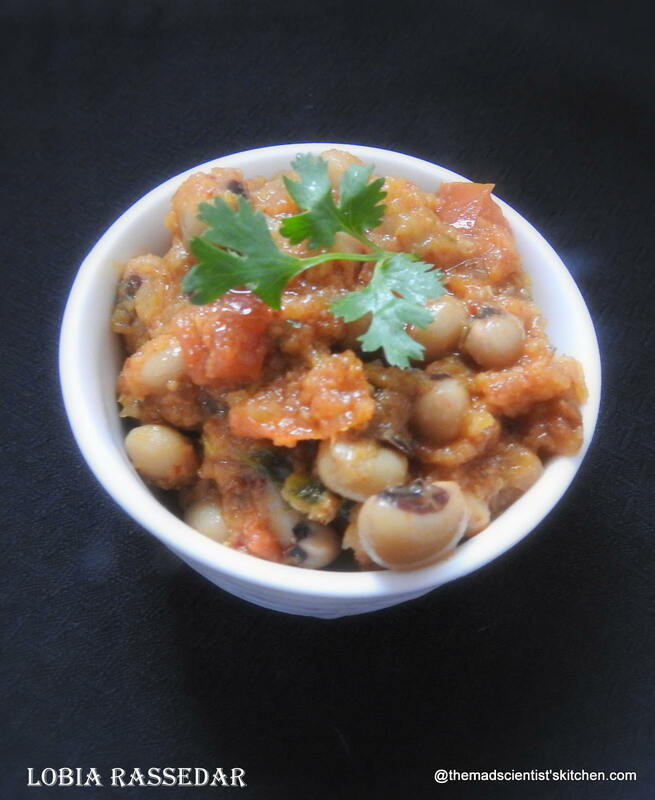 Lobia is known as cowpea and black-eyed peas and is an oval shaped bean with a black eye. Lobia can be used in soups and salads can be used in dal and vegetable preparations to enhance their nutritive value multi-fold. Cowpeas are not as popular as chickpea or kidney bean but are higher on nutrition. Lobia is filled with B-complex vitamins, protein, zinc, calcium and iron. 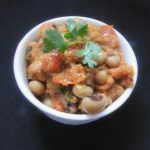 The Health Benefits of black-eyed peas are assorted as it has cholesterol-lowering properties, diabetic friendly as well as promotes weight loss.Lobia is packed with antioxidant compounds which keep ageing and cancer at bay. Lobia also contains a significant amount of flavonoids that protect against cardiovascular problems. Additionally, it also eases problems associated with urination. 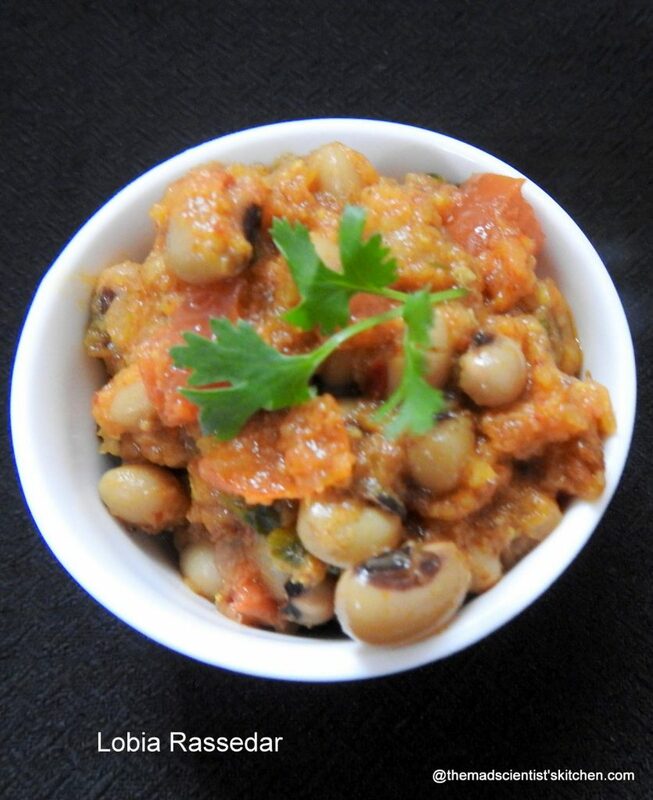 Since these beans are rich in Iron, protein and folate they are good for pregnant women. So is Lobia new to Goans? Of course not we call them Alsande and they are eaten traditionally as Boiled Alsande, Alsande Tonak, the leaves are eaten as a vegetable too, Alsande Usal. This month I will be featuring one more dish featuring Alsande so wait to see it. I have adapted it from Sanjeev Kapoor’s Book Kitchen Secrets. Soak the lobia in sufficient water for 4-5 hours. Pressure cook the soaked lobia until soft and the peas squash easily between your fingertips. Set aside with the cooking liquid. In a pan, fry the fenugreek seeds, cumin seeds and the dried red chillies in 1 tbsps oil. Take care not to burn them. Coarse grind the spices with the chopped ginger and garlic. Meanwhile, heat 3 tbsps of oil in a pan and add the cinnamon stick.once the stick starts sizzling add the onions and sauté for about ten minutes until the onions are medium brown. Add the tomato, ground paste, turmeric powder, red chilli powder, and salt. Add the lobia with its cooking the water into the pan. Add a little more water if needed. Cover and bring to boil, then simmer for at least ten to fifteen minutes. Garnish with cilantro leaves and serve hot. Though lobia is used a lot in the South Indian cooking, I have never heard of using the leaves before. Good to know that Archana! I simply love lobia and can have it in any form..this one sounds so good with rotis! We mostly use lobia in sundal or in gravies. This curry is such a great protein packed side dish for rotis. We love lobia curry but a slight more rasedar. Didn’t knew about the edible leaves though. So creamy and delicious lobia masala. Perfect with roti!! I think lobia is everyone’s favorite bean. 🙂 Seeing lot of lobia dishes this week. This rasedar sounds very interesting and perfect side for rotis. I use lobhia quite regularly . And this bowl looks great , perfect for protein Rich theme ! A tempting bowl of lobia. Would love to have it with some bread. One of the local dishes made in Kenya is cowpea leaves with coconut milk. Such a delightful protein rich lobia masala, am sure this gravy makes a prefect pair for some rotis.